TAMPA, Fla. (April 24, 2017) The cigar industry put Ybor City on the map in the 1800s as the Cigar Capital of the World, but now it’s getting another claim to fame as a tech district. Ybor City has more than 30 tech-related companies housed in the historic district. Click on the map to expand. Scattered among restaurants, breweries, art galleries and historic architecture, you will find some tech-savvy companies providing everything from custom application development and graphic design to digital marketing and satellite-based communications. 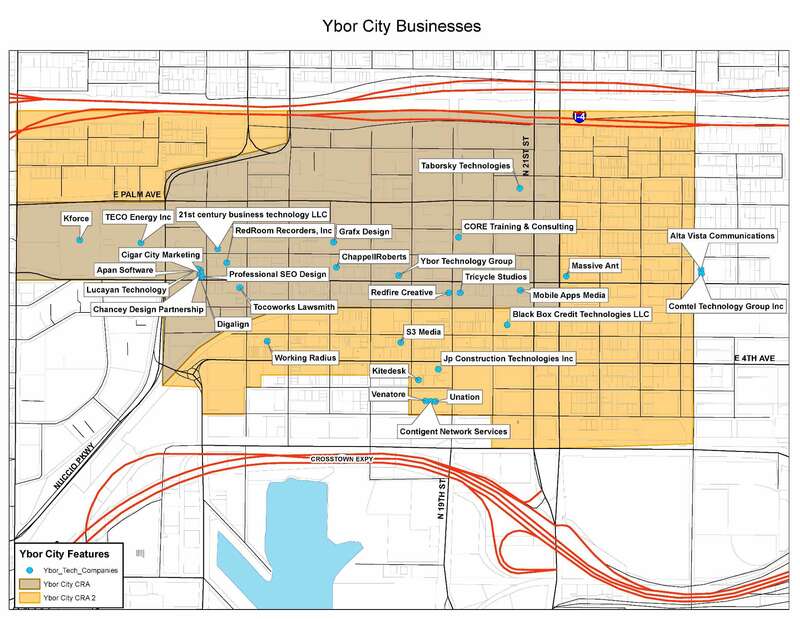 Currently, Ybor City has more than 30 tech-related companies housed in the historic district. Organizations like the SOFWERX facility has been featured on CNN for their work in military development, while headquartered in the second oldest building in Historic Ybor City. SOFWERX was created under a partnership intermediary agreement between Doolittle Institute and the United States Special Operations Command (USSOCOM). The same historic charm is giving some unlikely cities like Ybor City, traction as key tech hubs, including Austin, Richmond and Chattanooga. The once fly over cities are becoming more marketable to the cost of living compared to San Francisco or New York. Austin, Texas is home to Dell and other big names including GE Aviation that opened a digital collaboration center last year. Another up and coming hub is Richmond, Virginia, the capital of the Confederacy during the Civil War. It carries a similar charm to Ybor, once being the center of tobacco manufacturing. Chattanooga, Tennessee also has embraced a tech boom. Their super-fast Internet has drawn several startups to the city. Ybor City has more commercial space to rent than any other place in the city. Not only is the district visually appealing, but restaurants, shops and bars all are within walking distance—a breath of fresh air for techies after staring at a computer screen for several hours. Last year, Tampa was awarded a $3.8 million grant by the U.S. Department of Labor to foster tech training. The Tampa Bay Tech Hire program, administered by Tampa Innovation Alliance, provides free fast-track IT certification and paid work experience to 1,000 individuals between the ages of 17 and 29. SOFWERX engages local universities to educate young students in high-caliber Science, Technology, Engineering and Mathematics (STEM); in addition to offering unique internships. SOFWERX hosts a monthly tech talk the first Thursday of the month for members of the community and a monthly engineering challenge. Open Hack groups also host events every month in Ybor City. For those looking to jump in and learn everything they need to know about starting and growing their business in Hillsborough County, the Mark Sharpe Entrepreneur Collaborative Center is centrally located in Ybor City to provide free classes, mentoring, events and networking opportunities. Surrounding schools offer several programs to interest students in the growing field. Hillsborough Community College has a campus in the heart of Ybor and offers programs in computer programming, web design, technology security and more. The University of Tampa, minutes from Ybor, also offers courses in cybersecurity, digital arts, entrepreneurship and business information technology. The University of South Florida has similar degrees along with computer engineering classes. “When it comes to attracting the best talent, having a place that fosters collaboration between the best minds needs the right backdrop with everything Ybor.